Nonni's, the leading premium biscotti baker, has introduced two new limited-edition holiday flavors this season - Caramel Apple Biscotti and Cranberry Cioccolati Biscotti. Additionally, those who can’t get enough of seasonal flavors will be delighted to hear that favorites, like Pumpkin Spice Biscotti and Gingerbread Biscotti are returning. •Nonni’s Caramel Apple Biscotti are made with delicious apples, a blend of brown sugar and cinnamon, filled with caramel and delicately dipped in gourmet white icing. •Nonni’s Cranberry Cioccolati are made with sweet cranberries and delicately dipped in rich dark chocolate. •Nonni’s Pumpkin Spice Biscotti are made with real pumpkin, a blend of robust spices and delicately dipped in gourmet cinnamon icing. •Nonni’s Gingerbread Biscotti are made with real molasses, premium spices and delicately dipped in white icing. Having become familiar with Nonni's Biscotti a couple years ago, I now consider the gourmet dunking cookies to be a tasty sweet snack. Biscotti are crisp, rectangular cookies and have a dry, crunchy taste and texture. The added ingredients of almonds, icing, berries, and other ingredients give extra tasty flavor in each bite. There are approximately ten Biscotti cookies in each package. They are individually wrapped for freshness. Although people tend to dip their biscotti in coffee or hot tea, I tend to eat them alone. All four seasonal flavors are heavenly. I like the addition of icing or chocolate on top of biscotti, adding a nice sweetness. My favorite time to eat Nonni's Biscotti is when I'm at work and craving a snack. Because they're not high in calories, I don't feel guilty about eating them and they satisfy my cravings. 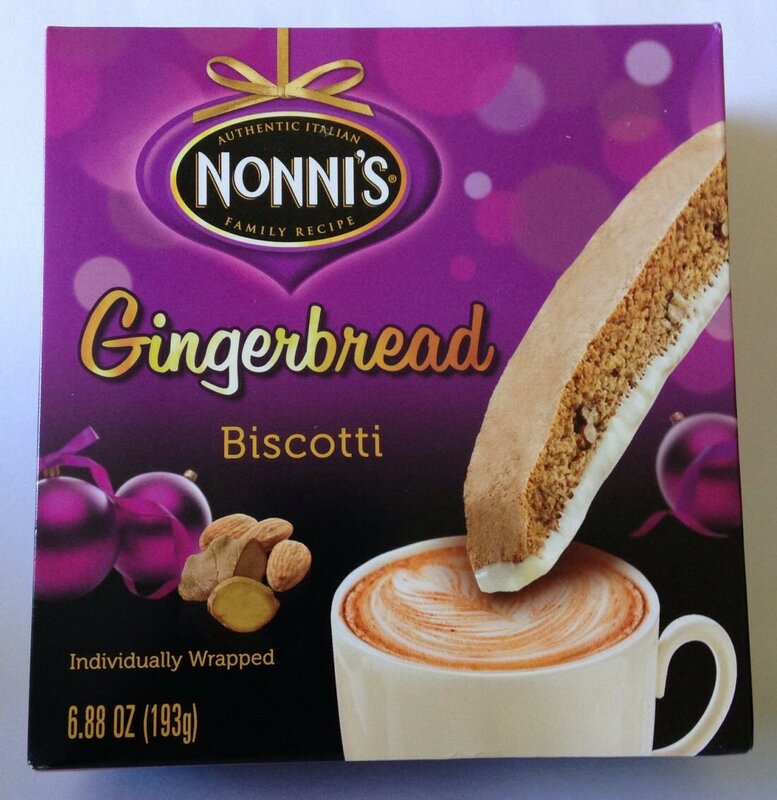 One person will win four boxes of Nonni's Biscotti seasonal flavors. All the flavors sound wonderful. I would like to try first the Cranberry Cioccolati. I am torn between the Pumpkin Spice and the caramel Apple. I think I'd like to try the Caramel Apple flavor first. I'd try the Cranberry Cioccolati first. I can't wait to try Gingerbread. For my first choice I would choose the Cranberry Cioccolati. Two of my favorite flavors. I am excited to try the Gingerbread, I love ginger cookies. Wonderful choices for fall flavors. Pumpkin Spice looks like the most delicious right now, so of course I want to try that one first! I like the Bold function for a richer and fuller body taste! I am excited to try the caramel apple first. Caramel Apple sounds good to me. I just had a bad run in with pumpkin, so that one isn't for me. I'm allergic to it. Hmmm....it's between the gingerbread and the pumpkin spice flavors. They all sound super delicious. I'm most excited to try the Gingerbread. The smell and taste of gingerbread feels like it's Christmas time for me! I am most excited to try the Pumpkin Spice! Sounds so yummy! I definitely want to try the gingerbread first! To me, cranberries are really underrated. I'd reach for the Cranberry Cioccolati first! I am most excited to try the Cranberry Cioccolati flavor. I am most excited to try the pumpkin flavor. I am most excited to try the Pumpkin Spice flavor first! I would want to try the Caramel Apple flavor ones first. The cranberry chocolate sounds wonderful. Thanks for the giveaway. I would love to try Cranberry Cioccolati first! They all sound good but I'd like to try Cranberry Cioccolati first. I would like to try Pumpkin Spice flavor. I'd like to try caramel apple. I buy Nonni's all the time! I want to try the Caramel Apple! I want to try the Gingerbread flavor. I would most like to try the caramel apple flavor. It sounds perfect to have with coffee on a cool fall evening. I would love to try the gingerbread flavor first! I'd most like to try the Gingerbread. I'd like to try the Cranberry Cioccolati ones the most. I'd love to try the Cranberry Cioccolati flavor. I'm most excited for the Gingerbread. I can't wait to try caramel apple. I think of the four new flavors from Nonni's I am most excited to try the Cranberry Cioccolati. Pumpkin Spice would be the one I would most like to try. Looking forward to trying the Caramel Apple. I'd like to try Pumpkin Spice. I love pumpkin flavored things (but I promise I don't go out and buy it all in the fall!) So I'd love to try the pumpkin spice the most! I'm most excited to try the Pumpkin Spice flavor first!